Repeat after me: “The best cure for low commodity prices is low commodity prices.” This mantra isn’t very comforting if that’s mostly because producers are forced to slash their output of commodities to match the world’s depressed demand for commodities, which is depressed by the economic and financial repercussions of the producers’ retrenchment. (1) World oil demand rose 2.0% y/y to a new record high last month. That’s the best growth rate since August 2011. (2) Developed and developing oil demand are both growing faster with gains of 0.9% and 3.1%, respectively. (3) World oil supply, however, continues to outpace demand. I use OMI data to calculate a ratio of demand to supply. It fell last month to the lowest reading since January 1999. There are plenty of other global economic indicators suggesting that the global economy is growing, and benefitting, on balance, from the drop in commodity prices. In the past few days, I’m being asked more frequently: “What will it take to revive the bull market?” Yesterday’s decline was the fifth consecutive daily drop. The S&P 500 may very well retest its August 25 correction low, which was 12.4% below the record high on May 21. The recent low nearly matched last year’s mini-correction low on October 15, which was attributable to fears about the termination of QE4 at the end of that month. There were also concerns about the impact of plunging oil prices and the soaring dollar on earnings. Yet stocks managed to rally 14.4% from last October’s low through this year’s record high on May 21. It was yet another relief rally as investors concluded that outside of the Energy sector, earnings were holding up surprisingly well. Nevertheless, here we are again, right where we were about a year ago. The correlation between the S&P 500 and the Fed’s holdings of bonds is working all too well. During the current bull market, many of the relief rallies were triggered by central bank moves to provide more liquidity into financial markets. As I observed yesterday, the central bankers may be starting to lose their credibility. In my opinion, investors would have favorably greeted the widely expected Fed rate hike following the September 16-17 meeting of the FOMC. It would have demonstrated the Fed’s confidence in the strength and resilience of the US economy. Instead, the FOMC passed on doing so, emphasizing for the first time concerns about the global economy and financial system. Yet on Thursday, Fed Chair Janet Yellen said that she still expected a rate hike before the end of the year. Yesterday, FRB-NY President Bill Dudley said the same. The Fed’s transparency makes it transparently clear that Fed officials are clueless. That’s not good for investor confidence. Yesterday, Dudley said that the US economy is “doing pretty well.” Notwithstanding the recent puzzling hawkishness of the Fed’s two leading doves, they and their colleagues on the FOMC will continue to confront a weak global economy when the committee meets on October 27-28 and December 15-16. They will have to be concerned that combined with the strong dollar, the US economy won’t continue to do so well. That’s what’s unnerving investors right now. Yesterday’s implosion in Glencore’s stock price was the latest confirmation that the global commodity industry is in a major bust, which is also depressing capital goods producers of mining equipment. In addition, yesterday we learned that profits at Chinese industrial companies plunged 8.8% y/y in August, with losses deepening even after five interest-rate cuts since November and government efforts to accelerate projects. Leading the losers were Chinese coal companies. I am starting to think that getting a relief rally this time might be more challenging than in the past, when central banks had more ammo and more credibility. If the market’s main concern is the slowdown in global economic growth, there’s not much reason to expect any upside surprise anytime soon. If the US economy remains strong, it is unlikely to be strong enough to lift global growth. Meanwhile, investors may continue to fear that the poor economic performance of the rest of the world will increasingly weigh on the US. So what will it take to revive the bull given this assessment of the global economic situation? As long as it doesn’t all add up to a global recession, the bull should find comfort in good companies that can continue to find growth in a world of secular stagnation. Commodity users should continue to benefit from the woes of the commodity producers. Valuation multiples are also more attractive now than they were earlier this year. Needless to say, earnings have to keep growing and US consumers have to keep consuming for the secular bull to survive this latest challenge. The most frequently asked question in my meetings with accounts in recent weeks has been: “What’s your take on China’s economy?” I have been pessimistic on China’s economy for well over a year, mostly because of the producer price deflation. However, pessimism may be too widespread and excessive now. Since the yuan was devalued on August 11, the US stock market has been much more sensitive to any indicator coming out of China. The latest one, released on 9/23 by Markit, showed that September’s flash M-PMI fell to 47.0, with the output component down to 45.7--both at 78-month lows. Commodity prices remain under downward pressure, confirming the weakness in China’s factory sector. Also confirming China’s weakness are production indexes among its major trading partners. 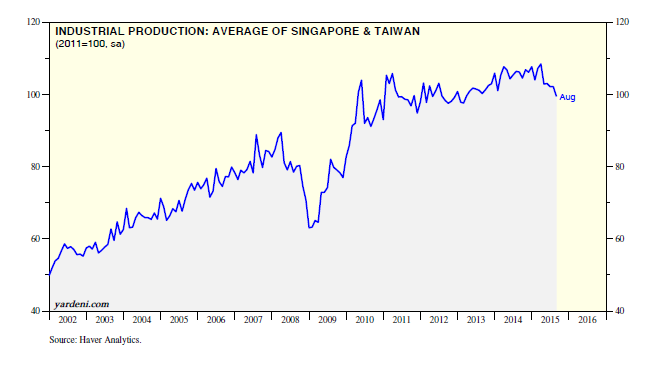 Industrial production indexes are falling in both Taiwan and Singapore, with the average of the two down 8.3% over the past five months through August. 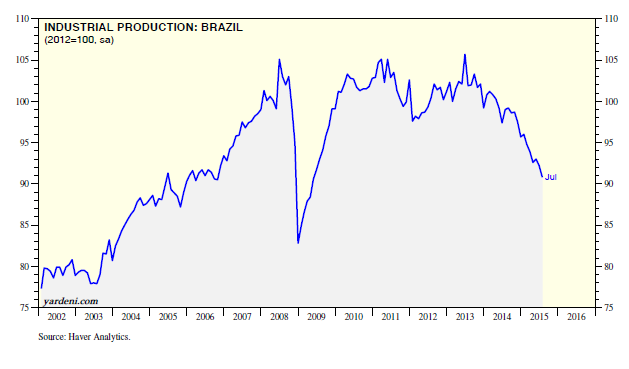 Brazil’s factory output is down 8.3% y/y to the lowest since May 2009. (1) Major markets giving back gains. The US MSCI stock price index is down 5.3% ytd (through Tuesday), and has underperformed since the start of the year. The All Country World MSCI and All Country World ex-US MSCI are down 4.7% and 4.0% ytd in local currencies. However, the UK MSCI is down 10.3% ytd, while the Emerging Markets MSCI is down 7.4% since the start of the year. Japan (2.6%) and the EMU (0.6%) have been outperforming all year, but have recently given back most of their strong gains earlier this year. (2) Shining city on the hill. Since the start of the current bull market on March 9, 2009, the US MSCI is up 188%, while the All Country World ex-US is up 77% in dollar terms and 83% in local currencies. The ratio of the US index to the world local-currency index charted over time shows that the US underperformed briefly in late 2012 and earlier this year. The US has been outperforming since late 2010 according to this ratio. (3) Reversal of fortune for MEI sectors. During the bull market of the previous decade, I favored overweighting the Materials, Energy, and Industrials (MEI) sectors of the S&P 500. They were up 154%, 223%, and 125%, well ahead of the S&P 500’s gain of 96% from March 11, 2003 through October 9, 2007. Since the start of the current bull market, they’ve mostly underperformed, especially this year, with gains of 138%, 48%, and 228% versus 187% for the S&P 500. These sectors tend to do best when Go Global is outperforming Stay Home, which it did during the previous bull market, but not during the current bull market. The performances of Energy and Materials in particular have suffered this year as commodity prices plunged. The outperformance of the Industrials sector during the current bull market is mostly attributable to transportation stocks. (4) Weak currencies less bullish for EMU and Japan. Stock prices rose in both the Eurozone and Japan in recent years despite lackluster economic growth. Investors turned bullish on both after the ECB and BOJ stated their commitments to do whatever it takes to revive growth. The two central banks implemented QE programs aimed at depreciating their currencies to boost exports. So far, the results have been disappointing, which may be reflected in the 18.1% decline in the EMU MSCI (in euros) since April 13, and the 13.8% decline in the Japan MSCI (in yen) since June 1. (5) Emerging markets submerging again. The Emerging Markets MSCI (in local currencies) performed relatively well during the current bull market until the recent selloff. However, it underperformed in US dollar terms since 2012, and especially this year. The dollar-denominated index is highly correlated with the CRB raw industrials spot price index. This isn’t surprising since the strength or weakness of the global economy has a big influence on both. The bottom line, though, is that the EM MSCI is really just a proxy for commodity prices. Chart technicians are turning increasingly bearish. That’s largely because the S&P 500 was losing its upward momentum earlier this year and mostly moving sideways as its leadership narrowed. If it continues to move sideways following the latest correction, the 200-day moving averages of the S&P 500 and its 10 sectors might start to roll over. A few technicians are already saying the market is making a major top and entering a bear market. I am a meat-and-potatoes fundamentalist with a drizzle of quant to enhance my meals. However, I will stay for dessert to chat with technicians. In any event, I am monitoring the 200-dmas of the S&P 500 and its 10 sectors more closely. There certainly is some rolling over going on, especially for the two most globally sensitive sectors, namely Energy and Materials. The interest-rate sensitive sectors are also looking a bit toppy, particularly Telecom Services and Utilities. On the other hand, the sectors with most of the market capitalization in the S&P 500 remain on 200-dma uptrends, particularly Consumer Discretionary, Consumer Staples, Health Care, and IT. S&P 500 forward earnings is highly correlated with the US index of coincident economic indicators (CEI). The latter rose to another new record high during August. Previously, I have observed that based on the past five cycles in the CEI, the next recession should start during March 2019. That’s not based on science, but rather on a simple average of the length of the previous expansions once the CEI had rebounded back to its previous cyclical peak. So it’s a benchmark of what could happen based on what happened in the past on average. (1) Three players. Corporate buybacks along with M&A activity have most noticeably reduced the supply of shares issued by nonfinancial corporations in the FOF tally. Over the past four quarters, their net equity issuance was minus $490 billion. This is the most negative this series has been since Q2-2008, and it has been in negative territory since the mid-1990s. On the other hand, US financial corporations had net equity issuance of $250 billion over the past year. This series has been in positive territory since the beginning of the previous decade. There’s been a significant increase in net equity issuance by foreign corporations, which rose to a record $549 billion over the past four quarters. (2) Grand total. The sum of these three series adds up to $309 billion over the past four quarters. While the S&P 500 data show that buybacks have been increasing throughout the current bull market, the FOF data on total net equity issuance was positive during 2009 and 2010, when financials had to raise lots of capital. Then it turned negative during 2011 and 2012 as financials significantly reduced their issuance. Since 2013, it has been increasingly positive as foreign equity issuers raised record sums in the US stock market. Greetings from Toronto! I am visiting our accounts here on Wednesday and Thursday, and going to see our accounts in Cleveland on Friday. I guess I should have stayed home to watch Yellen’s press conference today. However, I figured I might learn more on the road. Yesterday, the chief investment officer of one of our accounts observed that today’s FOMC meeting might be one of the most important in history. Then again, what if they decide to do nothing? That could be important too! I had lunch with my CIO friend yesterday in a restaurant with a spectacular panoramic view of downtown Toronto. I observed lots of building cranes, as were just as plentiful during my previous visits over the past few years. I asked whether they were all being used to construct more condominium towers with apartments that are purchased mostly by Chinese investors who leave them mostly vacant. Interestingly, he said that may be partly an urban legend and that more likely residents are young Canadian professionals, who prefer to live in town near their jobs. No houses, no cars, no kids for them. (1) Technically in a recession. Canada has been hard hit by the bursting of the commodity super-cycle bubble. Real GDP fell -0.5% (saar) during Q2 following a -0.8% drop during Q1. Just yesterday, the OECD cut its forecasts for the country’s economic growth by -0.4ppts to 1.1% for 2015 and by -0.2ppts to 2.1% for 2016. Canada received the second-largest haircut for 2015 next to Brazil in the lineup of economies included in the OECD’s forecasts. There is some debate about whether Canada is in a recession. Weighing on real GDP have been commodity-related gross fixed capital formation and exports. On the other hand, household consumption in real GDP has remained relatively strong. By the way, the OECD also lowered its world forecast for real GDP by 0.1ppt to 3.0% for 2015 and by 0.2ppt to 3.6% for 2016. The OECD is concerned that the slowdown in China’s trade is depressing many emerging market economies (EMEs). On the bright side, the OECD noted the strength of the US, but also suggested that a US rate hike could worsen the prospects for EMEs. (2) Another commodity currency. The Canadian dollar, which is down 20% y/y, is highly correlated with the CRB raw industrials spot price index. That should boost Canada’s exports, which account for 31% of the country’s nominal GDP versus 13% in the US. The problem is that manufacturing accounts for only 10% of Canada’s economy. So commodities account for a much bigger share of exports than do manufactured goods. As a result, the weaker currency isn’t likely to stimulate Canada’s economy. If the FOMC doesn’t start raising interest rates tomorrow, that wouldn’t surprise me. I have been anticipating either one-and-done or none-and-done for 2015 since September 2014. If it’s none-and-done tomorrow, there could be a significant liftoff in the prices of commodities, bonds, stocks, and currencies around the world. It might have started yesterday when the S&P 500 rose 1.3% to 1978.09. The index is up 5.9% from 1867.61 on Tuesday, August 25, which I predicted might be the low for the latest correction. It is down only 7.2% from the May 21 record high. The rally in recent days is especially impressive given that the latest batch of Chinese economic indicators was weak, as I discussed yesterday. This suggests that yet another relief rally is underway, this time following the panic attack that followed the depreciation of the yuan. What if the FOMC votes to hike rates by 25bps on Thursday? Odds are that Fed Chair Janet Yellen will spend most of her press conference that day reassuring the markets that further rate hikes are unlikely for some time. So there could still be a liftoff in the financial markets, but a more gradual one. (1) Exports & imports. Merchandise exports have stalled around $2.3 trillion (saar) since early 2013). Imports also stalled starting in early 2013 and turned weaker this year. (2) PPI, profits, & output. The trade surplus (in dollars) has widened to a record high because imports have been weaker than exports. However, both suggest that foreign investors are finding fewer good opportunities in China, especially since there has been a glut of manufacturing capacity, as evidenced by the 42 consecutive months of declines in the PPI. This pervasive deflation suggests that profits are hard to come by in China, which explains why the growth rate in industrial production has plunged from a record high of 20.7% y/y during February 2010 to only 6.2% during August. (3) Retail sales & stock prices. Inflation-adjusted retail sales rose 8.8% y/y during August. The days of double-digit growth seem to be over. The recent boom and bust in the stock market probably didn’t directly impact very many Chinese, but it can’t be good for consumer confidence. (4) Social financing. Over the past 12 months through August, China’s bank loans are up 15.7% (Fig. 13). A year ago, when the Chinese government was hoping to make the economy less dependent on debt, this growth rate was 13.3%. Over the same period, total social financing, which includes bank loans, rose $2.5 trillion. China’s economy seems to getting a lot less bang per yuan for all this debt partly because of the worsening of its international capital account. Notwithstanding the slow pace of global economic activity, we expect enough strength in the US to drive earnings higher. While the S&P 500 Transportation index is down 19.3% from its record high on January 22, measures of actual transportation activity are very strong in the US. Railcar loadings of intermodal containers rose to a record high in early September, up 5.3% y/y based on the 26-week moving average of the data. The ATA Truck Tonnage Index rebounded 2.8% m/m during July, remaining on its solid upward trend with a y/y gain of 3.7%. It’s just shy of its all-time high reached in January of this year. The plunge in gasoline prices has supercharged gasoline usage, which is up 3.2% y/y through early September. Vehicle miles traveled rose to a record high during June. It’s hard to do all that driving without stopping along the way to do some shopping. The 9/8 Business Insider website included an article titled “I just got back from Burning Man and here’s what I saw.” The author recounts that this annual festival at Burning Man in the Black Rock Desert, a remote part of Nevada, attracted 70,000 people and “was as wild as ever.” The stock market also seems to have turned wild as ever over the past few weeks. However, it hasn’t been a festive development for many other than high-frequency traders. The range for the S&P 500 is now much wider, spanning 263 points between the record high of 2130 on May 21 and the August 25 low of 1861. The daily swings certainly have become wild. The flash-crash correction and all the volatility have depressed the Investors Intelligence Bull/Bear Ratio, which fell to 0.92 this week. That’s the lowest since October 2011. It’s so bearish that it’s bullish, at least from a contrarian perspective. Readings below 1.00 have provided strong buy signals in the past. 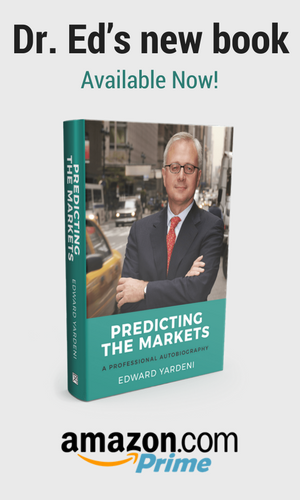 From a fundamental perspective, investors are fretting over lots of known unknowns. China’s economy is slowing, but is it a bumpy, soft, or hard landing? Might it be hard enough to cause a global recession? The plunge in commodity prices might be good for consumers, but bonds issued by commodity producers are at risk of default, as evidenced by the rising yield spread between corporate high-yield debt and 10-year Treasury bonds. The currencies of emerging market economies (EMEs) have been in freefalls this year as a result of capital flight. Won’t that put them into recessions, and might there be some sort of EME crisis? If the Fed does start raising rates, might that cause a massive unraveling of global carry trades? We all know what the issues are. We just don’t know how they will actually play out. No wonder that investors aren’t in a festive mood. Nevertheless, stocks may be set up for yet another relief rally if all the worst-case possibilities of the known unknowns don’t unfold. Just as important for the bull case is that no matter what happens, the US economy remains resilient and strong. So far, that seems to be a known known. I see plenty of evidence of that in the latest survey of small businesses and the JOLTS report. Not surprisingly, there is a strong inverse correlation between the yearly percent change in total non-gold international reserves (in dollars) and the trade-weighted dollar. The former is down -4.5% y/y through June, while the latter is up 12.3% over the same period. That’s because roughly 35% of these reserves are held in non-dollar currencies. It turns out that the yearly percent changes in the CRB raw industrials spot price index and in total non-gold international reserves are also highly correlated. The index is down -13.2% y/y. This suggests that some of the weakness in reserves is directly related to the end of the relatively short-lived commodity super-cycle, which wasn’t so super and turned out to be the latest speculative bubble that has burst. Commodity-producing countries, especially among the EMEs, are obviously taking big revenue hits in dollars, though those dollars are worth more in their local currencies. In any event, they are earning fewer dollars than can be accumulated in the local central bank’s reserve account. In other words, causality runs both ways between global economic activity and international reserves. The recent weakness in reserves growth reflects some drying up of global liquidity. However, it also reflects the slowdown in world economic growth attributable to the forces of secular stagnation that I have previously discussed. They include the untimely death of the commodity super-cycle caused by excess supply, which has been facilitated by ultra-easy monetary policies, as well as the burden of heavy debt loads weighing on demand around the world, geriatric demographic trends, and disruptive technologies (automation and robotics). The bear case is fairly compelling right now. However, it seems always to be compelling because it plays to our basic instinct of fear, which can often trump greed--the other basic instinct driving stock prices--fairly quickly and unexpectedly. This could turn out to be a good year for bearishly inclined chart technicians, but that’s after getting it mostly wrong for the past six years. I track Death Crosses and other technical indicators, but I don’t give them as much weight as I do the economic and earnings fundamentals. The bull case hinges on whether the US economy and earnings can continue to grow even if global economic activity continues to weaken. Of course, that’s the bull case for US stocks, and consistent with our Stay Home investment theme. It might even be bullish for Eurozone stocks as long as the region continues to muddle along. However, it’s hard to make a bullish case for the stocks, bonds, and currencies of emerging markets, especially given the fairly convincing case for the unwinding of the global carry trade, particularly if the Fed does start to raise interest rates. (1) Boom in US labor market. Believe it or not, there still are economists arguing that the US labor market needs to make more progress before the FOMC starts to raise interest rates. Indeed, some of them are members of the FOMC, and one of them heads up the IMF. However, Friday’s employment report for August was overwhelmingly strong, on balance, in my opinion. My Earned Income Proxy, which closely tracks the trend in private wages and salaries, rose 0.7% m/m last month, and 4.9% y/y. Granted, August’s payroll gain was only 173,000, but it is bound to be revised higher as were the previous two months in Friday’s report. In the household survey, August’s full-time employment exceeded the previous record high, set in November 2007. The unemployment rate was 5.1% last month, the lowest since April 2008. (2) Crawling along in the Eurozone. The volume of retail sales in the Eurozone rose 0.4% m/m during July to the best level since February 2011. The bad news is that German factory orders declined sharply during July. However, German industrial production (including construction) rose 0.7% that month. (3) China is the muddle kingdom. China may be slowing, but it isn’t falling into a recession, in my opinion. The plunge in China’s share prices since June 9 may be an ominous leading indicator of a worsening economic situation. More likely, it is the bursting of a bubble that has been inflating for a very short time, i.e., since November of last year. (1) The value of construction put in place rose 0.7% m/m during July, and 13.7% y/y, to the highest pace since May 2008. Leading the way over the past year has been nonresidential construction (up 18%), with particular strength in manufacturing (73), amusement & recreation (60), and lodging (41). Construction of factories has been soaring into new record-high territory since January of this year. (2) Motor vehicle sales jumped to a new cyclical high of 17.8 million units (saar) during August. Leading the way have been light truck sales. The former is up 2.8% y/y, while the latter is up 9.0%. Our monthly analysis of global oil demand shows that the plunge in oil prices is stimulating usage, which suggests that the windfall is boosting economic growth around the world. Over the past 12 months through July, world oil demand rose to a record 94.6mbd, and is up 1.9% y/y, up from just 0.8% a year ago. The growth rebound can be seen in both advanced and emerging economies. Oil demand was up 5.4% in China during July, from 0.2% a year ago, to a new record high. India’s usage is up 5.6%, the fastest pace since May 2008. So why are oil prices so low? There’s too much supply. Our ratio of global oil demand to world oil supply fell to 1.01 during July, the lowest since February 2007.